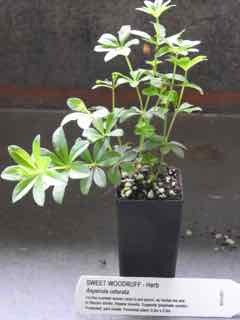 The attractive vanilla scented leaves of Sweet Woodruff plant, Asperula odorata, are used in pot pourri and to scent linens. A stewing herb, also used as a herbal tea and to flavour drinks. An insect repellant. Benefits the lymphatic system. Sweet Woodruff plant is indigenous to Asia, Europe and North Africa and grows in any good garden soil, in a protected, partially shaded position. Clusters of small star shaped, scented flowers in spring and summer. Drought and frost resistant. A perennial plant, growing to 0.2m x 0.5m. Be the first to review “Woodruff, Sweet plant” Click here to cancel reply.